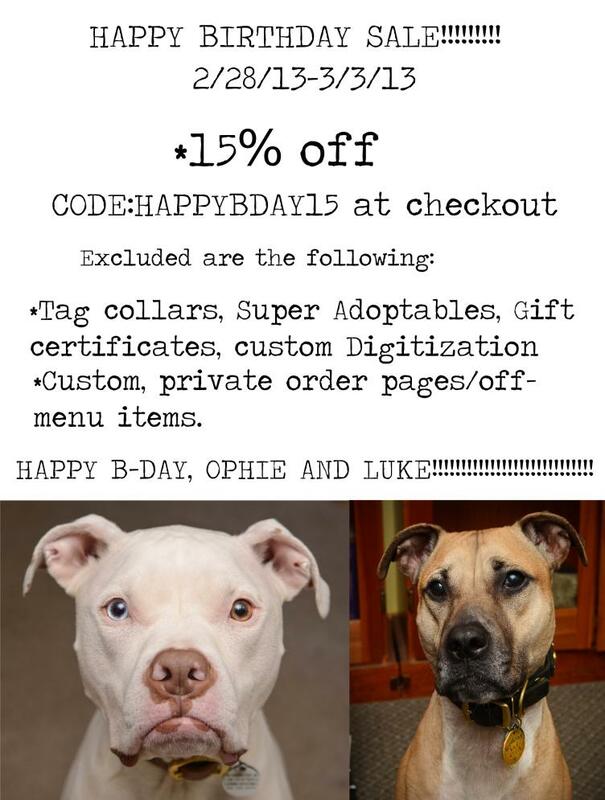 Today is Ophie and Luke's estimated birthday! Holy crap, right? TIME FLIES! There is a sale!!!! Checkout the photo below for details! The name, for us, came from the sound of how many times I (Rebecca) dropped all those tiny dome spots onto the floor as I'd grab a handful to bring to the work table. I mean, we could call it "Rat-A-Tat-Tat-Cling-Ding-Ding-Fling-More-Spots-Dropped-To-The-Floor", but I thought I'd condense the name down to "Rat-A-Tat-Tat". This collar is a double leather collar that is bordered in tiny small dome spots. The top strip is decked out in larger dome spots. A decorative, flashy collar. "We'll laugh at that old bloodshot moon in that burgundy sky." This is one our new "Limited Release" collars. One of the things we love the most about our "Limited Release" collars is that it gives us a bit more artistic control while eliminating some of the confusion of choice for our customers. It allows us to appeal not just to those who want totally custom collars, but to those who get a little foggy and dizzy by all the customizable options. This collar's name was yanked from a line in Tom Waits' "A New Coat of Paint". It is available only in burgundy leather with red rhinestones. We love it. And we hope you all will, too. Boondock Saints: An Inspired collar. The Saint. "And shepherds we shall be..."
A Boondock Saints inspired collar. Named after the legendary wyverns (winged, serpent-like dragons). This collar might possibly the coolest of its kind. It is decorated with six conchos that have a dragon that is swirled from its feet to its head. Each concho is framed in two small flat round silver spots. The Niamh. A little Gaelic inspiration. Decked out in large celtic shield conchos and small dome spots, this collar has beauty down to an art.